establishes the connection between your CMS and the FlavorPrint API platform. A valid API-Key must be provided for authentication. Please request a key here. shows recipes from a recipe pool, specified by the API-Key. It also allows for interactions with the recipe such as LIKE/DISLIKE and jump to the detail page. Please note that behaviour differs based on the users login status. As FlavorPrint is meant to enhance the user’s experience with personalised recommendations, a user login is required. 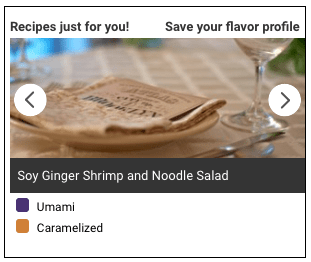 provides similar capabilities as the recipe tile plugin but shows multiple recipes at ones, based on canvas real-estate.